There’s still time to make travel plans for the Collision Industry Conference next week in Nashville and join stakeholders in what an agenda released Monday promises will be a discussion of a diverse set of industry issues. The two-day Nashville, Tenn., CIC includes emphasis on the workforce, including technician development and recruiting discussion and awards for collision repair students. However, its content also runs the gamut of topics like California customer data privacy, “The Cost of Quality” and parts definitions. The CIC will begin with the Data Access, Privacy and Security Committee at 1:10 p.m. April 17 examining data access and privacy legislation. The topic recently arose in Massachusetts with the introduction of multiple bills to expand “Right to Repair” on electronics. Those bills called for standardized means of accessing vehicle information which would be accessible to aftermarket repairers. They also declared the vehicle owner the owner of all data generated from a car and able to control who can access it — such as an OEM or repairer. The automotive aftermarket and OEMs have worked fairly well together for a while on diagnostic support and standardization, but the OEMs’ need for vehicle cybersecurity could create problems for independent repairers, an Equipment and Tool Institute leader warned shops at the January CIC. The committee will also provide a Q&A on Assembly Bill 375, a privacy issue of concern for shops in California — and beyond, should other states receive copycat legislation. The measure takes effect in 2020 and imposes a “bailment” duty upon a shop to protect the customer’s data, attorney Patrick McGuire said at the January CIC. Following that, the Governmental Committee will examine the various pieces of OEM repair procedure legislation at 1:40 p.m. It’ll be interesting to see how well that’s working and if the introduction of exemptions for parts has placated opposition. I-CAR Board Chairman Tim O’Day (Gerber Collision) and Vice Chairman (Kyle Roach) along with immediate past Chairman Jim Roach (Honda) will offer an update at 2:30 p.m.
“Panel Discussion to discuss true cost of quality from multiple segment perspectives, while also including the consumer,” the agenda states. Every percentage point of the overall auto market an automaker controls is worth $5 billion, Sean Carey of SCG Management Consultants said in 2016. and OEMs have realized that a bad repair or a total loss costs them some of that share. FCA has found that 60 percent of customers which received an incomplete or inadequate repair sold or traded that car within a year, according to Carey. About 63 percent of those dissatisfied customers switch brands. JD Power research released in 2015 found collision repair customers ranked speed as the second most important factor to them — second to quality. That customer feedback led J.D. Power to weight quality as 24 percent of its repair satisfaction score, and speed at 18 percent. The Emerging Technologies Committee will at 3:50 p.m. be the final session before the open mic period at 4:45 p.m. The panel will look beyond regular technician recruitment — already a challenge for some shops — to recruiting a “New Technician” qualified for advanced electronics. “The ‘New Technician’ and how to recruit, train and manage that role; How to address technician capabilities for troubleshooting and repairing advanced electronic systems; Implications for ADAS recalibrations per OEM procedures; further troubleshooting and executing the repair with resources,” the agenda item states. CIC will pick back up again the next day with the topic of technician recruitment in an 8:10 a.m. session hosted by Elite Body Shop Solutions CEO Dave Luehr. That will be followed by the 8:30 a.m. awarding of scholarships and grants to local collision repair program students and an 8:50 a.m. tool presentation “Designed for the industry, collision repair students,” according to the agenda. The Collision Repair Education Foundation — which helps vo-tech collision programs improve and match students with jobs — will then announce a new industry program at 9:10 a.m. The Insurer-Repairer Relations Committee will feature “Questions to the OEMs” at 9:25 a.m. One wonders if that conversation touches on any of the issues the January CIC audience indicated they’d like the committee to address. Another interesting topic to see here might be the increase in premiums and total losses insurers and repairers have warned will occur under more complex vehicles and OEM repair procedures. If OEMs confirm they’ve considered this issue but feel the net benefits to customers outweigh these cost of ownership concerns, then shops and insurers can quit expending energy sounding the alarm and instead move forward accordingly with structuring their business around this reality. The Education and Training Committee at 10:20 a.m. will hold a panel on “Critical Practices beyond Scanning.” The mere requirement to scan a vehicle has been such a hot topic over the past two and a half years that other items related and unrelated to it probably have been overlooked; this session could be a good way to tackle those. CIC Chairman Jeff Peevy (Automotive Management Institute) while introducing new Parts and Materials Committee Chairman Ken Weiss (SSF Imported Auto Parts) observed at the January CIC that conversations with 308 collision repairers prior to the CIC meeting revealed much frustration and confusion over parts definitions. Weiss, who will present this month along with SCRS Executive Director Aaron Schulenburg, said in January he had been “very vociferous” in his opinion regarding the “chaos” of parts definitions, and he wanted to find an industry-accepted solution. 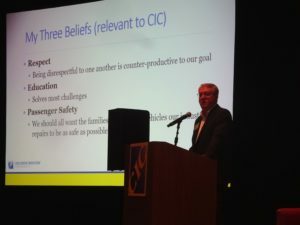 CIC Chairman Jeff Peevy (Automotive Management Institute) while introducing new Parts and Materials Committee Chairman Ken Weiss (SSF Imported Auto Parts) observed Thursday that conversations with 308 collision repairers prior to the CIC meeting revealed much frustration and confusion over parts definitions.